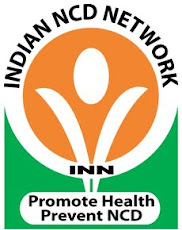 The Indian NCD Network (INN) is a non-profit organization that was created with the aim of networking scientists working in the field of NCD and to support research and training activities on NCD in India. More than one fifth (20%) of the world’s population lives in India and an additional 15 million Indians live elsewhere. Recently there has been a paradigm shift in the health problems in the country from communicable disease to non-communicable diseases (NCDs), which include diabetes, hypertension, cardiovascular disease, mental illness, chronic obstructive pulmonary disease and cancer etc. Diabetes: India leads the world presently with 35 million diabetic subjects and this figure is projected to increase to about 80 million by the year 2030. Approximately 20% of world’s diabetic population resides in India. Cardiovascular disease: It has been estimated that in India more than 2.4 million deaths are due to cardiovascular disease, which is approximately 25% of all the deaths, which is far greater than the deaths due to infectious diseases like diarrhoea, respiratory infection and tuberculosis. In about 15 years, India is expected to lead the world in cardiovascular mortality. Hypertension: Estimates suggest that nearly 55 million Indians are currently affected by hypertension. Various epidemiological studies in the Indian subcontinent have indicated a rising trend in the prevalence of hypertension, which ranges between 20 - 36%. Cancer: Annually around 70 new cancer cases are detected for every 100, 000 population in India and in any given year, there are almost 15 lakh cancer patients. Deaths due to NCDs: In India, deaths from NCDs are projected to almost double from about 4.5 million in 1998 to 8 million by the year 2020. In the year 2005, 53% of all deaths were due to NCDs and this is projected to increase by 18% over the next 10 years. Prevention: Prevention of NCDs becomes a major task, which demands a unified approach at the national level. Formulation of prevention strategies at the national level is possible only if we have a network which involves policy makers from all over India. As a young (I dont know if I can call me that at 35 Yrs of age) researcher, this was my first formal training in epidemiological research. The program as a whole is well thought out and structured one. As Prof D Williams says It was good, but can be better. It has been a great platform for freshers like us, its the kind of spark we need to pursue high quality research in one of the most significant areas of health for our country. I do hope the program continues to grow in stature and we get to see more professionals from various health disciplines actively participating in the program. Sure Sundar from Mangalore..we have noted your comments and will keep them in mind while planning this seminar next year! It's been over six months since this blog has remained idle. Can we start blogging more actively and share our experiences in NCD research, prevention and control ?